Each morning, we walk the short distance to the banks of the Ganges to sit in meditation for nearly an hour. Along the way we pass the sleeping shirtless man, in his makeshift permanent tent, with his dogs; an open manhole cover; and a giant mama pig rooting for breakfast as her pile of 5 babies sleeps protected beneath the dusty bushes. There is a tender breeze that becomes gustier as we ascend the steps up to the promenade, then even more pronounced as we cross it to descend down the other side toward the water. We are seated 9 steps up from the Ganga Ma – the mother Ganges. Before arranging ourselves to sit, we carefully take the steps that lead into the water to receive her blessing, Bending into a squat we each begin to create our own rituals. Mine is to place my right hand into the cold rushing water, to feel it, experience it, then scoop enough water to wash both hands, finally placing my fingertips on my forehead, as if to begin my day and my mediation with a clear mind. What others do is unknown to me, we are each in our own space. I am drawn in by this ritual. A part of me craves structure, but the lazier, obstinate part usually wins. Here I will embrace the sacredness of this action with the intention of carrying a piece of it home. Seated meditation does not come naturally to me, but I have learned it is the process, and the eventual progress, not the perfection of the practice that is the work. So I comply. The air is chilly and each gust of wind whips at the scarf covering my head. But I am content, happy even. Without the wind I would be lost. At a yoga teacher training, once upon a time, the question was posed, “In one word, how would you describe God?” Wind, was my immediate answer. Still is. And nowhere on earth have I felt this so tangibly as along the banks of this sacred river. I open my eyes. A lot. It’s part of the process for me. The huge ashram across the river, the Parmarth, is hosting the International Yoga Festival starting in the next day or so. It is glowing with preparation. To its left is the Ram Jhula bridge, lit with strands of green, white and red lights. And to its left, a few lights diminish into nothingness. The mountains rise up behind all of it – tiny lights high in the hills could easily be mistaken for stars. The light cast from the promenade behind us illuminates the rocks in the river that split the water creating eddies and ripples. There is great power in the speed of its flow. The sound mesmerizing. 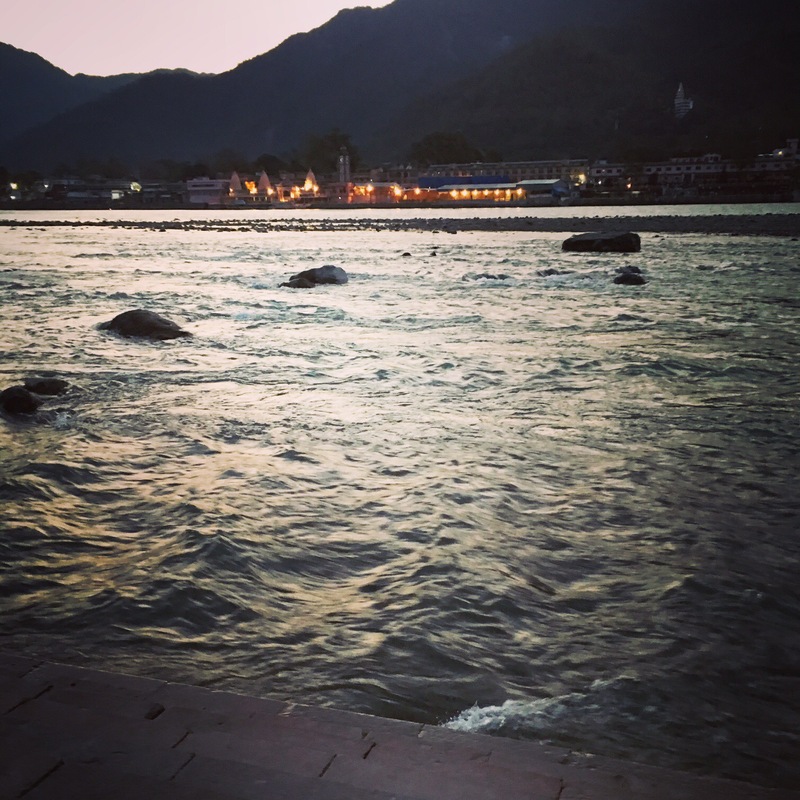 Swami Divyananda had said, “Sitting on the banks of the Ganges and meditating is like absorbing the prana (life force) of the river herself.” I agree. Directly in front of me, close to the steps, there is a rock that catches the water and throws it onto the bottom step. I use this as my focus for meditation. Time passes slowly. People are walking behind us, some chanting, some silent. I begin to identify them by their gait, their shoes. A family dips in the icy waters to our right, gasping and laughing. I catch the sent of sulfur as a match is struck to light the tiny flat disk of camphor, the size of my thumbnail, in the flower boat intended to send a blessing down the river. I am caught too deeply in observation to actually be meditating, but I try. Eyes closed, eyes open, uncross legs, recross, shift feet, sigh. I am not struggling, just observing how I am handling the impatience of my mind, the distractions. I am straddling both worlds and content in that. Suddenly Swami Divyananda oms, signaling the end to our practice for today. We bow in appreciation to the river, to ourselves, to our practice, and stand up to walk back to yoga. There will be no gap in thoughts today for me. No profound awareness of the silent presence. Yet I am left calmer and clearer for having made the attempt. The walk to the Parmarth Ashram is clean and well kept. I do not know why you wish to Introduce pigs and the homeless when you are speaking of Meditation. I walked daily across the Ram jhoola and was impressed with the upkeep.Walk along the the bank across the Parmarth Ashram, there is a lovely walkway lined bytrees.